In the beginning, all buildings were true to their form. They were "real", so to speak. It wasn't until recently that this trend was dented by alternative methods. This guide goes over such alternative techniques. Real buildings are when the interior-exterior layout are 1:1 coordinated. All the windows peer inside actual rooms you can walk into. There are rooms and places you can go to behind all the exterior walls in the structure. In a way, real buildings are the highest quality buildings in AW, because they mimic real buildings the best. However they have a few disadvantages. For starters, they take longest to build, but that's just the cost of quality in any case. Second, they potentially cause the most lag since they have full blown interiors. Third, they're difficult to build due to cell space. Also, exterior detailing is much more limited since objects cannot poke through the walls and into the interior. And last, the biggest reason, they're sometimes boring. This mainly applies to buildings such as apartment and office towers. No point in building dozens of apartment bedrooms is there? The Wing House is a modern marvel of real building engineering. 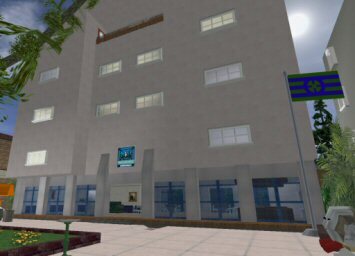 Modular structures are similar to real building, and are the solution for building fully furnished towers where normally cell space would run dry after only a couple floors. Unfortunately it's easily the most difficult and time consuming building type to make. Skip this section if you're not experienced using move commands. In this tower, the builder sets up interior modules somewhere (offsite or in a room). A module can be a clump of furniture, an entire arrangement of walls for a floor, anything. Where in a normal building, all the furniture/detailing and interior walls is static and never moves after being built, a module tower will shuffle modules around as the user moves through the building. This is done by placing invisible bump triggers along travel routes such as elevators/stairs, or activate triggers on doors. 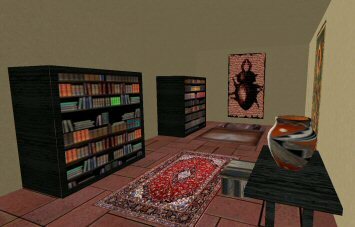 The triggers will use move commands to move the modules into the room the user is in, causing the illusion that the room is furnitured. The move commands use time=0 to move in instantly, and wait=9e9 to stay in place until given new move instructions from another trigger bump. Their main disadvantage is that you cannot look through windows from the outside, so you either have to make only windowed rooms real, or make the windows one-sided so you can only look through them from the inside. 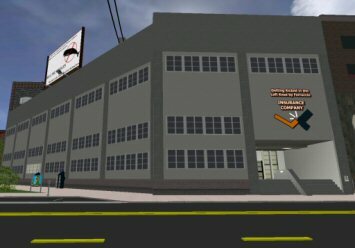 The CommieCorp Headquarters was the first building in SW City to use this technique. Third story hallway. 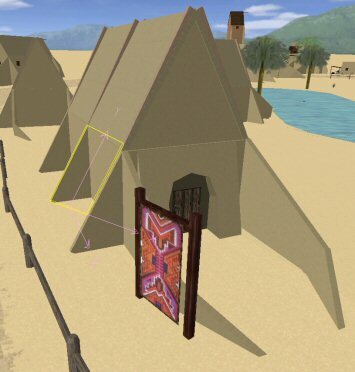 Each door triggers the objects to move into position. The hallway if you shift past the triggers. A simpler alternative is to create master rooms within the building. Inside these rooms are multiple sets of furniture and detailings, each given unique names. 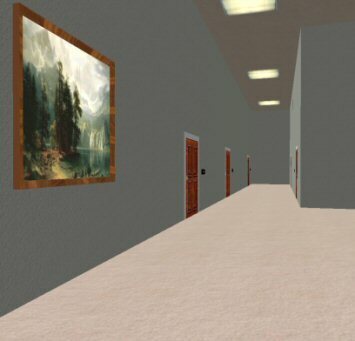 When a user walks through a room door, they will be teleported to this room, and the door will trigger the visibility of various sets of detailing inside that room. For example, one door might trigger a potted plant, a TV, and a desk, where another door might trigger a painting, some chairs, and a diffferent type of desk. This causes the illusion that each room is unique. The main disadvantage vs full modular structures is that since the room is geographically in the same location everytime, you can't exactly have real windows looking out. As such, simple modulars are especially well suited for inner rooms without windows. Shell buildings are structure where none or only some of the exterior walls coordinate with the interior. The exterior is basically acting as a "shell" around an interior. The interior has limited coordination to the outside world, only connecting into the exterior walls for a window a few times or not at all. Sometimes fake interior windows are used. Shell buildings are primarily made due to objects of exterior detailing poking through the walls and into the interiors (were it not a shell design). A shell adds enough buffer room inbetween the interior and exterior to avoid this problem. They're also ideal if you'd like a large exterior but a small interior. The interior doesn't have to be as big as the shell. A hybrid shell is basically a real building with some areas of the building shut off, with the windows closed. The is ideal if you built a building too large and don't want to create an interior for the whole thing. "Locked" doors inside can be used to acknowledge the closed off space is there, but not accessible at the moment. Swap shells are the newest technique used in SW City where interior and exterior components swap visibility as you go inside or out. 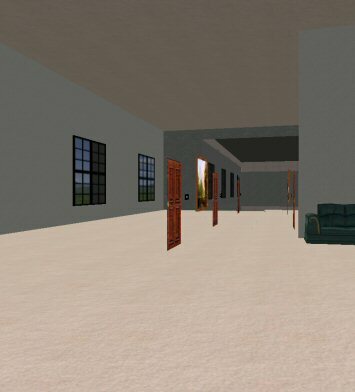 When the user enters the building, all named exterior objects are triggered to become invisible and non-solid, whereas all interior objects become visible and solid. This way, the interior can be larger and more true to the building's shape since the buffer zone is very small, if not gone completely. This is an ideal system for tiny structures where only small buffer zone can be used, or none at all. Another advantage is that since the interior objects are invisible when outside the building, this reduces lag. Swap shells also allow the interior to be bigger than the exterior, if need be. The main disadvantage to this system is there can be no real windows, and the user has to enter and exit the building properly to trigger the visibility triggers. Many of the buildings in Faldon Village use this technique. Outside the building. Note the select object pokes inside. Inside. The walls of the room are the same as the exterior walls. Poking objects were made invis. An isolated building is simply where the exterior and interior are entirely seperate from eachother. When the user enters the building, they are teleported elsewhere, to the interior. Usually the interior is put underground, where the builder is free to construct the interior unrestricted. The biggest reason you would do this is if both your interior and exterior are going to be packed full of objects. Keeping them isolated means they don't have to share the same cells. There's also the advantage of being able to build downward, underground, since Alphaworld has no terrain control. Last, since the interior is entirely out of the scene from the outside, the builder can turn the interior invisible to reduce lag. Fort Jamar is a good example of this. Sometimes only part of a building will be offset, and isolated elsewhere. Shell structures will usually do this to keep the cell-sucking components out of the way, such as an elevator system or stairwell. A facade, as its name suggests, is a fake building. A long time ago, facades were scoffed and laughed at, but today they've found their place and are in widespread use. A facade is only an exterior, no interior. 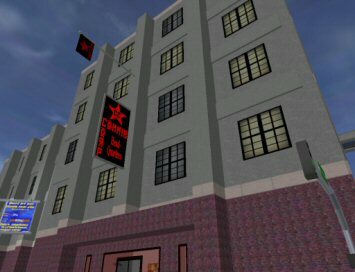 These buildings are primarily used for building up themed environments to compliment real buildings in the area while keeping lag down to a minimum due to no interior. Interiors are loaded with high poly furniture after all, whereas exteriors are very basic objects. Facades make up for their lack of interior by potentially having a stunning exterior, rich with detail, because it doesn't have to share cell space with an interior. Some facades are built with a few fake interior rooms. These interiors are only visible through the windows, and made the building look more real. Hybrid facades are the most common modern structure in SW City. A hybrid facade will have a real ground-level, while everything above that is fake. For example, ground-level shops, with apartments built ontop of it. This allows you to have all the benefits a real building enjoys, while keeping out the parts of the building that are the main problem. After all, the upstairs facade, if real, would be stories of boring apartment rooms or offices, causing lag and sucking away the cell space. This is a hybrid facade, except the upstairs is isolated, and built elsewhere. Lag can be addressed by visibility toggles, and cell space isn't an issue since it's offset.